Venus is in Pisces from March 26-April 20, 2019. Pisces never sees the world in black-and-white terms. Rather, Pisces sees all the colors of the rainbow. 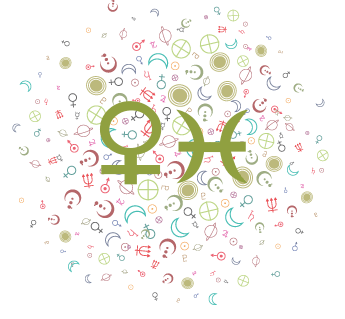 With the goddess of love in Pisces, our love is all-embracing, we are able to forgive and understand, we are seducible and seductive, and we show compassion to our partners. Venus in Pisces is tender and affectionate, although hard to reach nevertheless, as there is a longing for something that is hard to define and hard to satisfy. Borders and boundaries blur under Venus in Pisces. The shadow side of this position is allowing ourselves to be victimized or deluded, as well as evasiveness.